The first Jordan Family Reunion, March 3, 1893, honoring Eliza Jane Sadorus Jordan, widow of Captain John Jordan. Eliza Jane is seated on the left of the table. 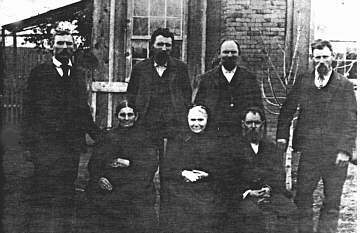 Next to her is Mary Ann Jordan Cortner, William Cortner, William F. Jordan, two unidentified women, John Jordan, Gilbert Bullard and J.B. Jordan. At the end of the table is Jenny Ellis and her husband, Sam Ellis. On the right of the table is Dr. Jim Combs, Mrs. Picayune Johnson, Leta Jordan Osborn, Inez Jordan Fitz, Preston Cortner, E.F. "Forney" Jordan and Mary Ellis Evans. 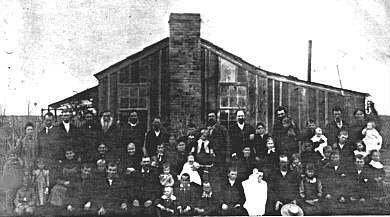 This picture is also at the Jordan Family Reunion, March 1893, at the home place north of Exeter. Photograph taken on Eliza Janes birthday, March 1, 1893. Front row L to R: Mary Ann Jordan Cortner, Eliza Jane Sadorus Jordan and William Francis "Bill" Jordan. Back row L to R: James Buchanan "J.B." Jordan, Elias Francis "Forney" Jordan, John "Johnny" Jordan and Frederick Omega "Fred" Jordan. No picture of Captain John Jordan was ever found.